EF Migrations in VS 2017 – Guess why I was postponing migration of ReMaster to Visual Studio 2017 for so long? Last week, everybody was talking about the final release of Visual Studio 2017. I have to admit, I was excited too so of course I installed it! At the beginning, everything seemed to be just fine. Nothing forecasted a few hours of google’ing to solve the problems that occurred later. When I installed VS2017, I have to do some of the strange tricks described in my previous post. There were errors claiming that my project lacks some Nuget package, which was of course installed but I knew the solutions so that was cool, really. In the end, adding migration started to work so I felt some kind of relief. Here we go again! Problem no 1. I googled a lot to solve this problem! Of my, I searched the whole Internet, seen all the kittens’ images and still no reasonable solution for problem with Update-Database in VS2017. That’s sad, shame on you, nasty Internet! At that moment, I even decided to let it go, come back to VS2015, eat a bar of chocolate and write a post entitled ‘Why I will never ever use VS2017‘. And get a lot of fame and FB likes because of that. Do you see the yellow highlighted part? Yeah, I finally saw it too! So I set the ReMaster (previously ReMaster.Web – migrating to VS2017 changed its name o.0 ) as the startup project. Opposite to the situation from the last post (about VS2015), where I wrote that I needed to set EF project as startup! Yay! This time it looked better. Could not load file or assembly 'Microsoft.EntityFrameworkCore.Design, Culture=neutral, PublicKeyToken=null'. The system cannot find the file specified. Could not load assembly 'ReMaster.EntityFramework'. Ensure it is referenced by the startup project 'ReMaster'. It seems that VS2017 has an opposite opinion at this subject :). So in ReMaster I added reference to ReMaster.EF. So I just installed Microsoft.Extensions.Logging in my ReMaster project. And updating database started to work! Visual Studio, you pugnacious animal, I still love you! 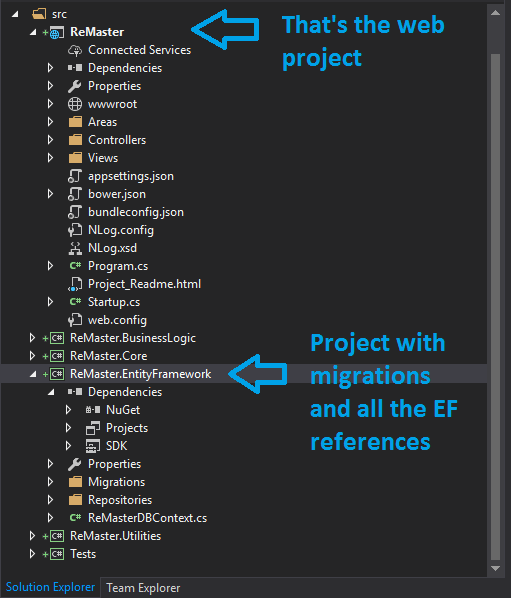 Previous: EF Migrations in .Net Core can be annoying! Next: New MS Windows this November! Some ealy leaks!